This month features the top percentile of all stocks covered at MANIFEST on the basis of return forecast and quality rating. 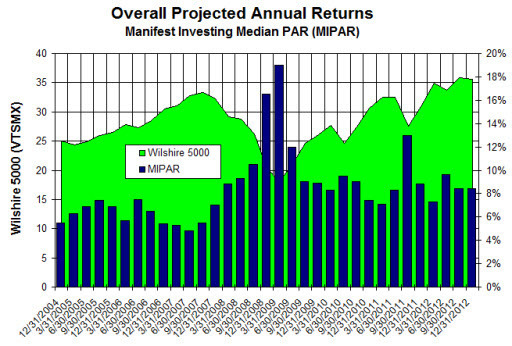 The median projected annual return (MIPAR) for all 2400+ stocks followed by MANIFEST (Solomon database) is 8.4% (12/31/2012). The multi-decade range for this indicator is 0-20% and an average reading since 1999 is 8.5%. We generated this month’s list of stocks by simply search for all companies with a MANIFEST Rank > 99 while limiting the field to financial strength ratings greater than 70 and EPS Stability of at least 60. Screening Results (12/31/2012). Top-ranked high-quality stocks with solid return forecasts. All qualifiers also have an EPS stability of at least 60 and a financial strength rating of 70 (B++) or better. The results are shown here in the accompanying table. With MIPAR at 8.4%, we compare it versus the long-term average forecast which happens to be 8.5%. So we’re literally looking at fairly average return conditions. And in times like this, it probably makes sense to tighten down the hatches — seeking higher-quality candidates with a little more financial strength. In the event of the next recession, we want to be well represented by industry leaders with superior profitability and relatively little debt. Likewise, in order to avoid cyclical whipsaws (and since earnings are the source of dividends) … we’d urge higher EPS stability ratings while bolstering our core holdings. This month’s screening result delivers a smorgasbord of companies that fit this bill. In fact, virtually all of the companies that we’ve added daily to the Core Diem portfolio since October are here in this month’s results. AeroVironment (AVAV) engages in the design, development and production of unmanned aircraft systems and energy technologies for various industries and government agencies. Whatever you think of drones, they’re here to stay. As I watched my 70-something grinning father-in-law open a remote operated helicopter on Christmas morning … these things have a lot of staying power. Coach (COH) has been a repeat Solomon Select feature (Jun-2006 & Oct-2008). Wall-to-wall standing room only at the outlet mall this holiday season. Across the way, a much larger Michael Kors (KORS) store was COMPLETELY EMPTY. Not sure how much of a competitive threat KORS can be. Bag this one. Masimo (MASI). November 2011 Solomon Select. Non-invasive. We still like this one a lot. And when you can’t invade, send in the drones.